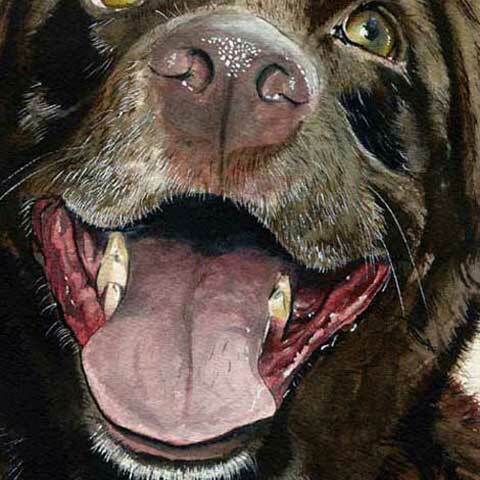 A good friend of mine and her husband are some seriously talented artists. Darlene does wonderful photorealistic depictions of vintage neon signs in various states of decay. Here is some of her work and here and here too! Her art is cool, trendy and great for any room you want to liven up! If you are interested in her artwork then contact her here for prices. 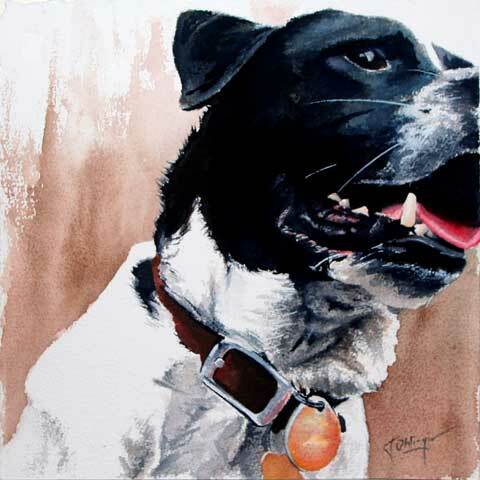 If you have a cute fur baby and would like a painting of them then contact JJ (tell him, "Tina sent you"). He does commissioned work. A few of my friends had their dogs painted by him and the results were awesome! 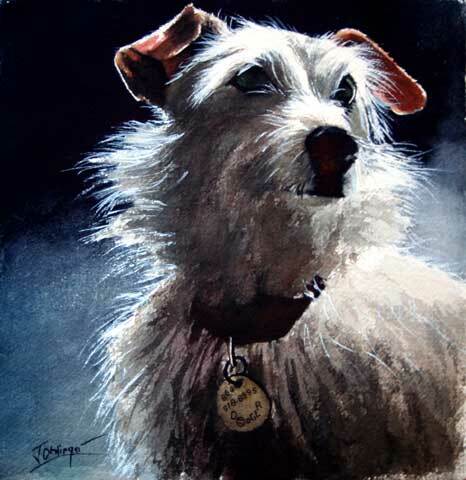 I think I am going to ask my hubby for some paintings of our pups for my b-day and Christmas presents. I am so excited! Check out their websites - Darlene Fuhst and JJ Ohlinger. I figure if I'm going to dress my boy then I might as well add some attitude to it. Some days we feel sassy and some days we feel classy. These cute and edgy K9 Duds t-shirts are just the ticket when you feel like showing off your wild side. My favorite (and the one I am getting Baby D for the fall) is this one. Every time I look at it I start laughing. They have so many more designs for the ladies and the dudes (and for the puppy dog parents). Yes, you can get matching tank tops!!! How cool is that?! 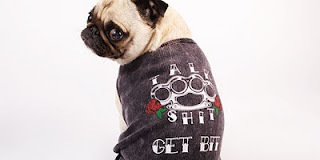 So if you're looking for a little 'tude for your dude then K9 Duds Clothing is a perfect fit. Do you live in Greenville, SC or the surroundings areas? If so, then I wanted to share a really great event with you called Paws For A Cause. Paws For A Cause is a one-mile dog walk to raise money for the fight against cancer (in humans and animals). The event takes place on October 2, 2010 at 9am at the Falls Park in Greenville, SC. They will also have music, games, raffles and contests to participate in. If you don't live in the Greenville, SC area but would like to contribute to the cause, they have gourmet coffee, tea and hot chocolate for sale on their website. Below is a video of last year's Paws For A Cause event. If you love animals and want to contribute to a great cause then grab your pooch for a fun filled day at the park! 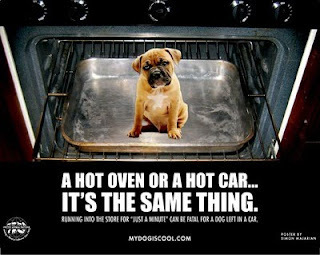 Hot Vehicles and Pets - DANGER! The "dog days" of summer are here. The heat can be very dangerous and deadly to dogs. I can't stress enough to people the dangers of leaving an animal in a parked vehicle with the windows cracked. A parked vehicle on a mild or warm day (much less a hot day) can reach temperatures of 100 - 130+ degrees in a matter of a few minutes. If anyone doesn't believe me then test it out for yourself (in the sun and the shade) on a hot day (on you NOT your animal). I did and I was floored at the results. Go to a store parking lot and turn off your vehicle, crack a window slightly (as you would do for your pet) then sit and wait. Sit in the vehicle as long as you can possibly stand it before you feel like you are going to pass out. It won't take long before you get out of the vehicle. Sadly enough, animals can't open the doors and escape like we can. Dogs don't sweat like we do. They pant to try and cool themselves off (which isn't very effective in a vehicle). We must also take into consideration that animals have fur and we don't, which makes them heat up even faster than we would. Every year, numerous animals die from being left in hot vehicles as their owners shop, eat lunch, run errands, etc. People don't realize how long they are in a store. The familiar words I've heard..."Oh, I was only in the store for a minute." Sadly, I have actually seen an animal killed by the heat of a vehicle from an owner who said those exact words. I walked by the vehicle after it was too late to save the dog....he was already gone. It was tragic, heartbreaking and completely unnerving to see. So many people want to take their animals with them on shopping trips but some stores (most food stores) due to regulations won't allow an animal in the store. The pet owner then leaves the animal in the vehicle sometimes unaware of the dangers. Please do you and your beloved pet a favor and leave them home. They will be much happier. You can always take them for a "joy ride" later on in the day. Another option (which I sometimes do) is to bring along a pet stroller for your pet to go in air conditioned stores with you (if allowed). A word of caution, only air conditioned stores. Places like Plant Nurseries or Garden Centers that are outdoors get too hot for animals even in strollers. 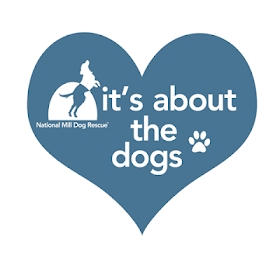 If you see an animal left in a vehicle and in distress then please do the following things: take down the car's color, model, make and license-plate number, have the owner paged inside nearby stores and call the police or local humane authorities/animal control. Have someone keep an eye on the animal. If police are unresponsive or too slow and the animal's life appears to be in imminent danger, find a witness (or several) who will back your assessment, take steps to remove the suffering animal and then wait for authorities to arrive. I found a great website that is dedicated to the dangers of animals being left in hot cars. It is called My Dog Is Cool. It has so much wonderful information and tools to help you better understand the dangers of animals and the heat (especially in vehicles). My little Chihuahua Patti Marie is getting older and has a good bit of health problems that prohibit her from moving around as much as she'd like. When we would go on our walks everyday I would have to carry her most of the time and she would get heavy after a while. I started looking at pet strollers so she and I could enjoy our walks more. Wow, I had no idea there were so many out there and that they could get very expensive if you let them. Being on a budget (which most of us are) I wanted a great product with minimal cost. I happen to find the perfect stroller for her size. 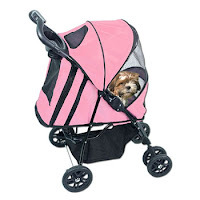 I purchased the Pet Gear Happy Trails Pet Stroller (in pink, of course!) for $100 and I couldn't be happier. The stroller also comes with a weather guard (just in case you get caught in the rain). I ordered mine online at Petco and couldn't wait for it to arrive. If you are interested you can also find coupons here for an extra percentage off the price. I use this fabulous stroller everyday and not just for Patti. I use it for my other dogs too. D'Angelo loves riding in the stroller as I enjoy taking him shopping with me every chance I get. He doesn't mind the pink color at all. ;-) Patti and I now enjoy long walks as she lies in her stroller enjoying every minute of the trip. When winter comes I put a warm blanket in it for her. In the summertime, I put a thin soft cover in it with an ice pack under it to keep her cool. Pet strollers are a great invention and they keep your pet safe too. 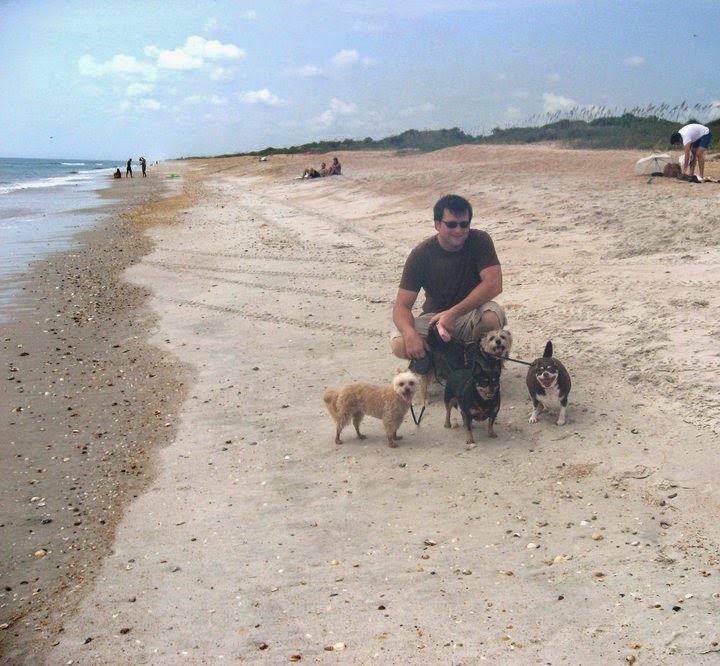 Helping The Animals of the Gulf Oil Spill! My cousin sent me an e-mail about this AMAZING little girl with a heart of gold. I checked out her website and was floored (in a good way). She is only 11 and already wanting to make a difference in this world. Below is a little history about Samantha "Sammie" and her cause. Please consider donating. I know I will! Sammie Save The Gulf: Samantha Abrahams is an 11 year old who wants to make a difference and save the animals of the Gulf of Mexico. And she needs your help. With her own money, she prompted her parents to help her create a non-profit charity that will provide help groups and organizations dedicated to rescuing and rehabilitating the animals affected by the April 2010 oil spill in the Gulf of Mexico. Samantha is an animal lover who is passionate about making a difference in her community and in her world. Please consider a donation that will help groups and organizations tasked with the difficult job of rescuing and rehabilitating birds, reptiles, and sea mammals struggling for survival. Please visit her website and Facebook page to learn more about how you can help! Does your pet like to go on car rides with you? My little D'Angelo does. He LOVES car rides. It's his favorite thing in the whole world (besides being with mommy). Vehicles can be dangerous places for your pet if they aren't properly secured in place. One way to do it is with what I like to call "Puppy Car Seat." I purchased a Pet Car Seat over 6 years ago and I love it. In fact, it is the most awesome thing that I have ever purchased for my fur babies. The brand that I have is called Snoozer Lookout II Pet Car Seat. 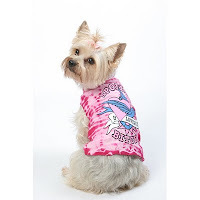 It comes in all sorts of colors and 3 sizes (small, medium and large) for your pets needs. I have the medium in Khaki Quilt...love it! :-) I can fit up to two of my pups in one car seat (I have smaller dogs). In fact, I love the pet car seat so much that I am buying two more since our fur family has grown in the past few years and we are taking a long trip soon. Snoozer has so many more pet car seats in an array of styles and colors. You can find them in stores or here - online. Take a look and I hope you will love yours as much as I love mine....great invention! Oh, don't forget about a harness to go with your pet car seat. I use the Travelin' Dog Car Harness. It is made with heavy duty nylon and lambswool for added comfort. You can find it at Petsmart (in stores and online). 1. Do NOT take your pet with you to see fireworks displays. Believe me, they will be much happier at home and you will be much happier that they are at home. 2. Make sure your pet has its collar and tags on it (even in the house). I have heard of big dogs eating through walls, tearing through closed pet doors, jumping through windows, etc to escape the loud noises. 3. If your pet is microchipped then please make sure that the information online (your account) is complete, correct, up-to-date and that you have a good picture of your animal placed on file just in case your pet is ever lost. So many people forget to update their information when they move or they forget to put the information on there from the initial sign up. Don't have your pet microchipped? Many local government agencies or humane societies now have discounted microchipping available. If you live in the Greenville, SC area then you can have it done for $ 10. 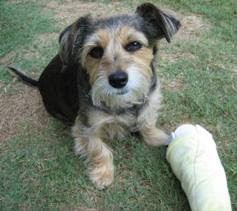 To see more info click here http://www.greenvillecounty.org/acs/microchip.asp. 4. Do NOT leave your pet outside or on a leash or chain in the yard. Pets can severely injury or kill themselves by trying to get away from the loud noises. There is also the fear that they will dig under or jump the fence to escape. 5. 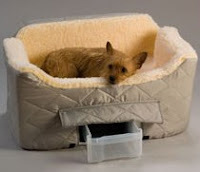 Bring your animal inside and put it in a cool, quiet bedroom or crate. For added comfort you may turn on a television (or radio) to a channel that has a calm program on (like HGTV, America's Funniest Home Videos, etc) or a music channel like Jazz. The voices from the television will help calm your animal down and make them think someone is there with them. If you are home with your pet then keep them close to you to make them feel safe. 6. Leave a blanket or piece of clothing (t-shirt, robe, etc) that has your scent on it with the animal(s). Your scent will help soothe the animal as well. 7. If you find a lost pet, please take it to your local animal shelter immediately. 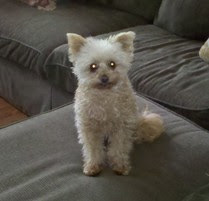 Most likely a frantic owner is looking for their beloved pet and they will be able to be reunited quicker.